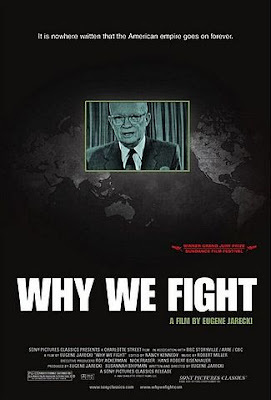 Why We Fight is 2006 Documentary film by Eugene Jarecki about the "military–industrial complex". The title refers to the World War II-era eponymous propaganda movies commissioned by the U.S. Government to justify their decision to enter the war against the Axis Powers. It describes the rise and maintenance of the United States military–industrial complex and its 50-year involvement with the wars led by the United States to date, especially its 2003 Invasion of Iraq. The documentary asserts that in every decade since World War II, the American public was misled so that the government (incumbent Administration) could take them to war and fuel the military-industrial economy maintaining American political dominance in the world. Film below but no sound, need to turn on CC, or download via bitTorrent.